The Federal Government is tracking four major diseases out breaks in Nigeria, Health Minister, Isaac Adewole, has disclosed. Mr. Adewole disclosed this in the weekly report of the state of the nation’s public health which he submitted to the Federal Executive Council on Wednesday. Mr. Adewole provided details on the development when he spoke with State House correspondents at the end of the FEC meeting in Abuja. “Council received the weekly report on the state of public health in Nigeria and we did inform council about four major outbreaks that we are currently tracking. “One is Lassa Fever and we are quite happy that there is a major decline in a number of reported cases. We have also not reported any deaths in the last two weeks but we still have two cases reported from Edo last week. 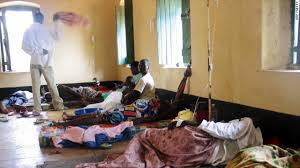 “We still have cholera in some parts of the country, particularly in Kano, Kebbi, Borno and Zamfara but the outbreak in Borno state is the most significant of all of them. “So far since the outbreak started we have recorded 2,719 suspected cases of cholera and we reported 51 deaths in total. The Minister added that the ministry informed FEC about one reported case of yellow fever in Kwara, adding that public health and surveillance officers were deployed to the state to assess the situation with a view to commencing immunisation. He said that the immunization would be in two local governments, one each in Kwara and Kogi. Mr. Adewole expressed delight that Nigeria had not reported any case of Polio since the last reported case in August. The minister appreciated the field officers and the armed forces helping in the containment of the disease in Borno by vaccinating the children in the difficult and security-challenged areas.